In Fiscal Year 2012, the United States Department of Homeland Security ("DHS") seized, at the border, $133 million of wearing apparel and $103 million in footwear that were counterfeit or pirated. Apparel and footwear accounted for 19% of the value of all goods seized for intellectual property infringement. DHS agencies Customs and Border Protection ("CBP") and Immigration and Customs Enforcement ("ICE") protect American consumers from intellectual property theft as well as enforce the rights of intellectual property rights holders by expanding their efforts to seize infringing goods, leading to 691 arrests, 423 indictments and 334 prosecutions. Counterfeit and pirated goods pose a serious threat to America's economic vitality, the health and safety of American consumers, and our critical infrastructure and national security. According to DHS, in recent years, the internet has fueled explosive growth in the numbers of small packages of counterfeit and pirated goods shipped through express carriers and mail. In FY 2012, DHS reports having heightened efforts against the sources of these small shipments: the websites involved in the trafficking of counterfeit and pirated goods. In FY 2012, 697 such sites were taken down by ICE, with CBP handling the forfeitures. The number of IPR seizures remained somewhat consistent from 24,792 in FY 2011 to 22,848 in FY 2012. The Manufacturer's Suggested Retail Price of seized goods increased from $1.11 billion in FY 2011 to $1.26 billion in FY 2012, with an average seizure value of more than $10,450. The report "Intellectual Property Rights Fiscal Year 2012 Seizure Statistics," is available on the CBP website CLICK HERE. The Cashmere and Camel Hair Manufacturers Institute announces its 2014 International Fiber Identification Symposium to be held 19 & 20 February at the CNR-ISMAC laboratory in Biella, Italy. Arranged in cooperation with CNR-ISMAC, the Symposium will feature presentations by noted authorities throughout the world on the subject of fiber identification with particular reference to cashmere, wool and specialty animal fibers. Professor Stefano Sforza, University of Parma, and Dr. Claudia Vineis, CNR-ISMAC, will present the featured presentation of the symposium on “UPLC/ESI-MS method to identify wool, cashmere and yak fibres”. The method, developed by the two institutions, and supported by CCMI and a consortium of Italian cashmere and fine wool processors, breaks new ground in the objective analysis and identification of wool and specialty animal fibres, utilizing protein analysis by means of the mass-spectrometry. This is a significant breakthrough particularly in overcoming some difficulties in microscopic identification of fibers of different animal species, but of similar morphology. Also on the agenda for the first day of the two-day symposium are foremost scientists and technicians from Japan and Korea discussing advanced fiber identification utilizing protein analysis (MALDI-TOF and liquid chromatography) and DNA analysis. The second day of the symposium will feature discussions on microscopic identification of animal fibres with presentations by Chinese, Korean, Japanese and Italian experts in their field. Attendees at the Symposium include representatives of CCMI member companies and textile laboratories worldwide. For further information please contact CCMI Representative Alberto Manferrari. January 31, 2014, on the Gregorian Calendar, is the beginning of the lunar new year, sometimes called Chinese New Year, and observed in many of the nations of East and Southeast Asia. Customs and Border Protection ("CBP") in Customs Bulletin Vol. 48 No. 4 (January 29, 2014) announced the revocation New York Ruling Letter N238691, dated February 26, 2013, with regard to the tariff classification of polyurethane coated gloves under the Harmonized Tariff Schedule of the United States ("HTSUS"). Similarly, CBP is revoking any treatment previously accorded by CBP to substantially identical transactions. Notice of the proposed action was published in the Customs Bulletin Vol. 46, No. 35, on August 22, 2012. Two comments were received in opposition to this notice. EFFECTIVE DATE: This action is effective for merchandise entered or withdrawn from warehouse for consumption on or after March 31, 2014. At issue was whether the subject gloves are classified in heading 3926, HTSUS, as other articles of plastic, or heading 6116, HTSUS, as gloves. The gloves are described as string-knit work gloves constructed of 50% polyethylene, 29% polyester, 14% glass fiber and 7% spandex with a polyurethane coating which covers the entire palm as well as a portion of the palmside cuff and overlaps the fingers and sides of the wearer’s hands. A polyurethane coating has also been applied to the underside fabric of the palms. The glove features an elasticized cuff and an overlock stitch finish at the cuff bottom. Classification of goods under the HTSUS is governed by the General Rules of Interpretation (GRI). GRI 1 provides that classification shall be determined according to the terms of the headings of the tariff schedule and any relative section or chapter notes. In the event that the goods cannot be classified solely on the basis of GRI 1, and if the headings and legal notes do not otherwise require, the remaining GRIs 2 through 6 may then be applied in order. (5) Plates, sheets or strip of cellular plastics combined with textile fabric, where the textile fabric is present merely for reinforcing purposes (Chapter 39). Note 2(p) to Chapter 39, HTSUS, states that the Chapter does not cover goods of Section XI (textiles and textile articles). Note 1(h) to Section XI, however, excludes, inter alia, articles of knitted or crocheted fabrics coated, covered, impregnated or laminated with plastics, of Chapter 39. Although these notes would appear to conflict, Note 2 to Chapter 59, HTSUS, clarifies the scope of Chapter 39 with regard to textiles coated with plastics and sets out definitive criteria for the determination of which fabrics that have been impregnated, coated, covered, or laminated with plastics are classifiable in Chapter 39, HTSUS, at GRI 1, and thus excluded from Section XI. Note 2(a)(3) to Chapter 59 directs the classification of textile articles in which the textile fabric is either “completely” embedded or “entirely coated or covered on both sides” by plastics to Chapter 39. Customs found that the gloves are covered only on the inside and outside of the palmside, not including the wrist cuff, and on a portion of the backside fingers (inside and outside). The remainder of the gloves, including the entire back side, are composed of non-coated textile fabric. Thus, the gloves are only partially covered or coated with plastic and are not described by Note 2(a)(3) to Chapter 59 or heading 3926, HTSUS. It was argued that the textile material of the instant gloves is present only for reinforcing purposes, and that the gloves should therefore be classified in Chapter 39 pursuant to Note 2(a)(5) to Chapter 39. Customs responded that the gloves are not subject to Note 2(a)(5) because they are not combined with cellular plastic. They are governed instead by Note 2(a)(3) to Chapter 59, HTSUS. In any case, however, the textile component of the instant gloves is present for more than mere reinforcement. The plastic coating may be said to reinforce the textile because it makes the textile substrate less permeable and more resistant to cuts or abrasions. However, it is meaningless to say that the textile fabric is reinforcing the plastic coating. The substrate of the gloves is entirely constructed of textile. The textile gives the gloves their form and shape, thickness, strength, etc. The textile material also provides stretch and give to the gloves, allowing them to be put on, used and removed without difficulty. In addition, the textile material, being more permeable than plastic, permits the gloves to be worn more comfortably, because it traps less perspiration than the plastic material. Heading 6116, HTSUS, provides for gloves. Although heading 6116, HTSUS, is in Section XI, it is only the heading text which controls, not the Chapter or Section titles. Thus, heading 6116, HTSUS, is not limited to textile gloves only. Indeed, the heading text does not limit the classification of gloves of that heading by the material of their construction, only the method of construction (i.e., the glove must be knitted or crocheted). Thus, heading 6116, HTSUS, includes gloves of textiles and plastics, or textiles coated with plastics. The instant glove is made entirely of a knit textile material which is subsequently coated with plastic. At GRI 1, heading 6116, HTSUS therefore captures the merchandise in its entirety. AMI Industries, Inc., doing business as Goodrich Interiors Specialty Seating, Colorado Springs, Colo., has been awarded a maximum $8,817,781 firm-fixed-price contract for installation of aircraft ejection seats. This contract is a sole-source acquisition. Locations of performance are Colorado, Oman, and Iraq with an Aug. 15, 2016 performance completion date. Using service is Oman and Iraq. Type of appropriation is fiscal year 2015 through fiscal year 2016 foreign military sales. The contracting activity is the Defense Logistics Agency Aviation, Robins Air Force Base, Ga., (SPRWA1-14-D-0001). The American Textile History Museum, located in Lowell, Massachusetts, recently announced that it has received a $1 Million gift from the estate of G. Gordon and Marjorie Osborn, longtime friends and supporters of the Museum. Mrs. Osborne passed away in April 2013 at the age of 103. She was the widow of textile industrialist G. Gordon Osborne, the former President of Warwick Mills and member of the ATHM Board of Trustees, who died in 2000. Born in India and raised in Canada and the U.S., Gordon Osborne earned a B.S. from Lowell Technological Institute and a M.S. and Ph.D. from the University of North Carolina, followed by an economics fellowship at Harvard. A textile pioneer who played an important role in the development and the history of the US textile industry, his extraordinary career in textile manufacturing spanned over six decades and a wide range of diverse textile applications and processes. Mr. Osborne died in 2000 at the age of 93 and was posthumously inducted into the American Textile Hall of Fame in 2008. Marjorie Osborne was born January 23, 1910, in Malden and enjoyed painting, as well as designing jewelry, silver, and clocks. She was a student of seascape artist Jay Hall Connaway and an avid collector of his paintings. Karl Spilhaus, a longtime friend and colleague of the Osbornes and President of the ATHM Board of Trustees, said that helping to ensure the Museum’s future success was very important to the couple. The Osborne Library, named in honor of Gordon and Marjorie Osborne, is a private research library containing a rich and comprehensive collection of printed, pictorial and manuscript material of interest to researchers in a variety of fields. The collections include more than 90,000 books, pamphlets, government documents, postcards, trade literature, images, periodicals and business records that record the history of textile production in the United States. The Museum welcomes support for ATHM’s future through bequests to the Museum in a will, trust, or other estate plans. Estate gifts support the Museum’s endowment, which continues to grow as they support Museum operations annually with a portion of the income generated. I don't care. I don't care what the books sold by Amazon claim. I don't care that it is expensive. I don't care what the rules say. I don't care what the little voices are telling you. When the time comes to file a patent application you need representation. Filing and prosecuting a patent application is a technical, complicated and confusing process and mistakes made early in the process can inhibit or even disqualify you from getting a patent. In order to represent clients in patent matters, a patent attorney or agent must be registered with the US Patent and Trademark Office. Registration requires an applicant to demonstrate technical competence through a technical degree or other methods. Applicants must also pass a comprehensive registration exam, informally known as the patent bar that demonstrates competency in patent law, regulations and procedures. While about three-quarters of registered practitioners are attorneys, this is not a requirement for registration with the USPTO. Registered practitioners who are not attorneys are called agents. Patent attorneys and agents are equally qualified to represent clients through all USPTO processes, however, only attorneys can do patent litigation. The difference is similar to CPAs and tax attorneys: while only attorneys can represent you in court, both CPAs and attorneys are qualified to represent you with the IRS. If you are fairly certain that your patent will be heading to litigation, I would suggest an attorney who can provide consistent representation from the application process through the litigation process. If cost is an issue, I would suggest an agent. In the same way that CPAs are generally less expensive than tax attorneys, patent agents are less expensive than patent attorneys. If your invention has technical problems or issues, I would suggest an agent. While patent attorneys have technical degrees, my personal observation is that patent agents seem to have more practical technical experience to bring to the table. A final observation: while a patent attorney is preferable for patent litigation, once a patent matter reaches the US courts they are not necessary. Registration is not required for an attorney to handle a patent matter in the courts. Weight Distribution and Support Device and System for Armor Vests: A load bearing weight distribution device. The device comprises a back brace and a waist belt. The waist belt is connected through a housing to back brace and tensioning mechanism. The back brace is a flexible body with arms. The load bearing weight distribution device is designed for use with armor vests and other similar devices. Patent #: 8572762. Inventor: Herbener, et.al. Assignee: KDH Defense Systems,Inc. Reversible Garment for Providing High-Visibility when Riding a Bicycle and Low Profile when not Riding a Bicycle and Method of Using Reversible Garment : A reversible garment with two sides that can be worn in reversible configurations. The first side is ordinary in appearance while the second side is highly visible. The reversible garment is preferably a bicycle jacket. The second side may at least partially comprise a material that is reflective, bright in color, or luminescent. The garment may use an elastic material to make the garment close-fitting in a high-visibility configuration. Patent #: 8572763. Inventor: Fitzpatrick. Assignee: Fitzpatrick. Exercising Glove: A glove with sensors attached to the glove body to detect hand exercise events. A memory component, powered by a battery, stores the hand exercise event. A device interface downloads the event. Patent #: 8572764. Inventor: Thellmann. No Assignee. Socks Having Areas of Varying Stretchability and Methods of Manufacturing Same: Socks manufactured with different stretch characteristics in different areas of the sock. Patent #: 8572766. Inventors: Shull and Shull. Assignee: Bear in Mind Company. Method for Manufacturing Inflatable Bladders for Use in Shoes and Other Articles of Manufacture: A more efficient and less expensive way to make inflatable bladders. Patent #: 8572786. Inventor: Davis, et.al. Assignee: Reebok International Limited. Shoe with Composite Upper and Foam Element and Method of Making Same: A bonded mesh composite panel used to form a three-dimensional upper shell that includes extensions used for double-lasting and/or to otherwise provide a shelf to support foam padding. The extensions of the upper shell may be located in a lower portion of the shell and may be bonded to the foam midsole in a heel, midfoot and/or forefoot regions. The benefit is to maintain performance and comfort while reducing manufacturing costs. Patent #: 8572866. Inventors: Dojan, et.al. Assignee: Nike, Inc.
Fluid-Filled Chamber with a Reinforcing Element: Several sole components and a method of manufacturing those sole components are disclosed. Each sole component includes a fluid-filled bladder and a reinforcing element extending around a portion of the bladder. The reinforcing element is bonded to the exterior of the bladder, and may be recessed into the bladder. In some configurations, the reinforcing element is die-cut from a sheet of polymer material, and the reinforcing element may exhibit a layered configuration. In manufacturing the sole component, the reinforcing element may be located within a mold, and the polymer material forming the bladder may be bonded to the reinforcing element during the molding process. Patent#: 8572867. Inventor: Parker. Assignee: Nike, Inc. Article of Footwear with Heel Cushioning System: An article of footwear with a heel cushioning system for an irregularly shaped insert (open to the ground on the lower insole surface). The heel cushioning system includes a sole, a curved plate and treads members. The tread members may lift a heel portion of a sole above a ground surface. The curved plate may deflect when a force is applied to the sole. Patent #: 8572869. Inventors: Mayden and Nomi. Assignee: Nike, Inc.
Feed Mechanism that Advances Fabric: This is a mechanism that automatically advances fabric towards the head of a sewing machine. It is part of an effort that is attempting to automate the sewing process. Patent #: 8573145. Inventor: Dickerson. No Assignee. Woven Multi-Layer Fabrics and Methods of Fabricating Same: A multi-layer woven ballistic fabric. The upper and lower layers are formed simultaneously. Patent #: 8573261. Inventor: Shekoufeh. Assignee: Barrday, Inc. The University of Massachusetts - Dartmouth, has announced that the recipient of the William F. Sullivan Memorial Scholarship for 2014 is Johana Uribe. She is currently taking Biomechanics, Intro to Bioengineering, Experimental Design and Analysis, Quantitative A & P for Design and a Sophomore Seminar. Her grade point average is 3.93. She will be graduated in 2016. Established on the records of the Southeastern Massachusetts University (now UMass - Dartmouth) Foundation in the spring of 1979 by gifts in memory of the late William F. Sullivan, this fund is intended to provide financial aid to students in good standing at the University who are majoring in the Textile Science and Textile Technology area. 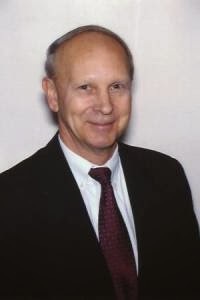 William F. Sullivan headed the Northern Textile Association and its predecessor the National Association of Cotton Manufacturers from 1950 to 1979. A noted labor relations expert and prominent legal representative of the industry in Washington on trade matters, he was Vice Chairman of the Textile Advisory Council of the Textile Sciences Department at S.M.U. He was a strong advocate of the school's textile program and worked with unusual effectiveness to bring knowledge of the program to the attention of the textile industry leaders in the North. His support of programs and participation of the Textile Department of the College contributed significantly to the awareness, prestige and enhancement of the Textile Science program at S.M.U. At the time of his sudden death in the spring of 1979, he was representing the Northern Textile Association at a convention. The investment income from the Fund is awarded annually to a student deemed scholastically or otherwise worthy by the Textile Scholarship Committee, with the approval of the Chairperson of the Department and Dean of the College. A bad Trans-Pacific Partnership free trade agreement will, "...eviscerate what is left of the footwear industry in the United States...," says Matt LeBretton, of Boston footwear manufacturer New Balance in this article from Sunday's Boston Globe. Tennessee based Bulwark has partnered with Milliken & Company to design the iQ Series of protective clothing, featuring superior comfort properties and advanced flame resistant-technology. Bulwark, one of the world's largest brand of flame-resistant (FR) apparel, today announced the launch of the iQ Series, a product line that delivers superior comfort through fabric and design innovation, without compromising the trust and safety of its wearers. Designed to meet the needs of workers and linemen in the electric utility, oil and gas, emerging energy and NFPA 70E (National Fire Protection Agency manufacturing) industries, the iQ Series aims to offer wearers increased comfort through superior breathability, mobility, softness, durability and moisture wicking, while providing protection from flames, arc flash fires and similar dangers. “At Bulwark, ‘No Compromise’ is our unwavering pledge to develop protective FR garments for workers who put their lives on the line every day. Each year we spend countless hours with workers who wear FR to understand their needs,” said Chris Holcombe, vice president and general manager, Bulwark FR. Bulwark, in partnership with Milliken, a global innovation leader across a range of industries including specialty textiles and protective fabrics, developed the innovative science behind the iQ series. As part of the engineering process, Milliken specially created yarns, fabric, and chemistry that it says will help increase workers’ comfort and productivity while providing protection against flame or heat. “Together with Bulwark, we have developed a scientific breakthrough – improved molecular technology that fuses total comfort with protection for FR wearers,” said Jack Spoon, Milliken & Company, business manager, workwear fabrics. Nine iQ Series products – six knits and three wovens – will be offered in men’s and women’s styles. The Bulwark brand has future plans to expand the iQ Series platform. Bulwark, is a North American market leader in durable flame-resistant protective garments. The brand was born in the Canadian oilfields 43 years ago, and according to the company, has been the choice of industry professionals ever since. Bulwark offers a wide range of NFPA 2112 and NFPA 70E compliant flame-resistant shirts, pants, jeans, coveralls and outerwear. Engineered Solutions Purchases Assets of Rocan Inc.
Hardy Poole, president of Engineered Solutions, PLLC, has announced the purchase of the intellectual and technical assets of Rocan, Inc., a company founded in 1989 by his colleague, Clyde T. Canter. Poole has some 40 years of experience in areas of the textile industry, including wearing apparel, upholstery and other home furnishings, military procurement and a general understanding of associated standards and government regulations. Established in 2003, Engineered Solutions, PLLC has served clients from industry, government, law firms, trade associations and retail clothing stores. In 2009, the two consulting companies joined forces to expand client services in research and a wide range of technical services related to flammability of textile products. Poole and Canter have collaborated as associates on research and in a variety of projects for clients that have interest in textiles, textile flammability, product safety and military textiles. Canter, a long term authority in flammability of textile products and a leading independent expert in product liability litigations, has retired, but will continue his role as an advisor to assist Engineered Solutions. Engineered Solutions' purchase of the intellectual assets of his colleague’s business include a unique technical library that contains a vast collection of reference files and publications relating to the flammability of textiles that now reside at Engineered Solutions’ headquarters in Charlottesville, Virginia, and laboratory facilities in Burlington, NC. The laboratory is equipped for microscopy & chemical analysis of textile materials and apparatus that enable testing in accordance with virtually all government and voluntary industry standards for flammability applicable to textiles. The laboratory also conducts more aggressive flammability tests and full-scale burning of clothing on dressed manikins in a fire-safe enclosure. Engineered Solutions is recognized as an independent organization that has conducted research and numerous flammability tests on textile products, including controlled ignitions on dressed manikins to demonstrate and compare burning characteristics of selected items of ordinary clothing. Brand & Oppenheimer Acquires Performance Textiles, Inc.
RED BANK, N.J. – January 21, 2014 – Brand & Oppenheimer Co., Inc. (B&O), a textile converter, today announced it has acquired the assets of Performance Textiles, Inc., a supplier of high-performance fabrics engineered for domestic and export customers, some of whom have worked with the company since its inception in 1988. The acquisition was sponsored by Praesidian Capital, which is an investor in B&O. The consensual acquisition will complement B&O’s textile capabilities with a diversified product line targeted to sports, recreational products, high visibility work-wear, commercial, military and government end uses. Founded by Bill Gerrow and Peter Sullivan, Performance Textiles has an industry reputation for fabric design and production. According to a company press releae, "Safety, maximum performance, and durability continue to be the main focus and are critical for fabrics that are destined for use in parachutes, hot air balloons, and industrial protective vests." Brand & Oppenheimer Co., Inc., now in its centennial year, is a supplier to the textile industry. Based in Red Bank, N.J., B&O has distinguished itself in the past 15 years as a leader in textile conversion for the U.S. military. The company’s principal owners are B&O management and Praesidian Capital. With operations in Duxbury, Mass. and Greensboro, N.C., Performance Textiles, Inc., produces high performance textile products for a variety of requirements in the commercial and military markets. During the past 25 years, the company has developed extensive experience in fabric manufacturing and quality assurance from raw materials through the final stages of treatments. In a recent Binding Ruling Letter (NY N236994), dated, December 11, 2013, to Mr. Brett Ian Harris, of Pisani & Roll LLP, 1629 K Street NW, Suite 300 Washington, DC 20006, U.S. Customs and Border Protection addressed the tariff classification of a woven and knit bonded fabric from China. The ruling request was made on behalf of Global Textile Alliance, Inc. The product will be imported in widths of 143-150 centimeters and will be used for upholstery. The style "Mkuze" is a bonded fabric consisting of a woven face fabric laminated to a brushed knit backing fabric. The face fabric is characterized by a resemblance to the leathery skin of a hippopotamus. The face fabric has been brushed, dyed and coated with polyurethane in a hot stamping process. According to Customs and Border Protection (CBP) laboratory analysis, the polyester face fabric is composed of 54.1% staple yarns and 45.9% non-textured filament yarns of different colors, is of satin weave construction, weighs 176.0 gm2, and bears a pattern created by applying a plastic coating on portions of the surface of the fabric. The warp knit non-pile backing fabric is composed wholly of polyester and weighs 123 g/m2. The bonded fabric as a whole weighs 321.2 g/m2. Mr. Harris suggested that style Mkuze be classified as a coated fabric under subheading 5903.20.2500, with a rate of duty of 7.5 percent ad valorum. Customs responded that "since the plastic adhesive that bonds the fabric layers together is not visible to the naked eye, and the plastic coating on the face fabric only partially covers the fabric surface, creating a design, this fabric is excluded from classification as coated fabrics of textile in heading 5903." Customs classified the fabric at 5515.12.0040, (other woven fabrics of synthetic staple fibers: of polyester staple fibers: mixed mainly or solely with man-made filaments, satin weave or twill weave) The rate of duty will be 12 percent ad valorem. Graphical Element Laminate for Use in a Skate Boot. This invention appears to be taking a basic ice skate and protecting and strengthening it with a clear thermoplastic laminate. Patent #: 8555527. Inventors: Koyess and Dekos. Assignee: Sport Maska Inc.
Multipanel Protective Undergarment: Paneled undershorts made of a protective fabric such as Kevlar. Patent #: 8561213. Inventors: Howell, et.al. Assignee: BCB International Ltd. Footwear: An athletic shoe with voids in the sole to cushion the impact of running. Patent #: 8555525. Inventor: Mahoney. Assignee: Saucony IP Holdings, Inc. Latch Needle with Improved Latch Bearing: A new latch needle design that improves precision and manufacturability. Patent #: 8561435. Inventor: Bruske, et.al. Assignee: Groz-Beckert, KG. Direct Driving Auxiliary Yarn Guide Apparatus for Flat Knitting Machines: A directly driven yarn guide to provide precision yarn feeds into a knitting machine. Patent #: 8561436. Inventor: Lin. Assignee: Pai Lung Machinery Mill Co, Ltd.
Elastomeric Articles Having a Welded Seam that Possess Strength and Elasticity: Elastomeric articles, such as gloves, are described that are made by welding two polymer films together. Polymer films are selected that have excellent elastic properties in combination with tensile strength properties. For instance, the polymer films can be made from a thermoplastic elastomer that has a tensile strength of greater than 40 MPa and has a modulus of from about 2 MPA to about 20 MPa. Patent #: 8566965. Inventors: Shamis, et.al. Assignee: Kimberly-Clark Worldwide, Inc. Pants with Waistband Having a Reinforced Loop: Pants that reduce the “back gap” of the wearer without using an elastic waistband. The pants include a waistband shaped to descend from the hip region to a rear center region, thereby resembling a shallow v-shape. The rear center region is configured to reach toward the back of the individual wearing the pants. In one embodiment, a reinforcement patch is used to provide foundation to connect a belt loop to the waistband. Patent #: 8566966. Inventors: DiSanto and Aldighiere. Assigned: Ariat International, Inc. Method for Manufacturing a Waterproof and Vapor-Permeable Shoe and Shoe Obtained with the Method: A method for manufacturing a waterproof and vapor-permeable shoe, including preparing a semi-manufactured component of an upper for a shoe, to be arranged spread out on one or two flat surfaces, arranging on the inner part of the semi-manufactured component of an upper a waterproof and vapor-permeable membrane, then preparing an adhesive bonding between the semi-manufactured component of an upper and the membrane so as to not inhibit the vapor-permeability of the assembly. Flat shapes, suitable of shaping complementarily with respect to different thicknesses of stitched seams and of superimposed parts are prepared, and the membrane is coupled to the semi-manufactured component of an upper, with the outer part arranged resting on the shape. The upper is finished associated with an insole, and a sole. Patent #: 8566991. Inventor: Mueller. Assignee: Geox S.P.A. Ventilation Sole for Shoes: A ventilation sole for footwear, in which an air inlet-outlet is formed in a side of the ventilation sole, vents are formed in an upper portion of the ventilation sole, the vents communicating with the air inlet-outlet, and a device for opening and closing an air inlet-outlet, which is coupled with the air inlet-outlet, supplies ambient air into the footwear. The device for opening and closing an air inlet-outlet is adapted to be opened or closed by a locking or unlocking action when turned, and is disposed in the air inlet-outlet such that it is exposed to the outside. Since the device is opened and closed by the turning action of the button cap, the user can conveniently open or close the air inlet-outlet. Patent #: 8567092. Inventor: Park. Assignee: Kyungdo Co, Inc.
Shoe Sole: A sole adapted to provide improved leverage during the toe-off stage of gait comprises elongate elements along the horizontal surface of the sole. The elongate elements are adapted to tauten in response to longitudinal forces on the sole, increasing the rigidity of the midsection of the sole and providing effective propulsive assistance to the athlete. Patent #: 8567097. Inventors: Edy, et.al. Assignee: Inoveight Limited. Footwear or Orthotic Inserts with Inner and Outer bladders Separated by an Internal Sipe Including a Media: An apparatus that improves the flexibility of the sole and as a single unit simplifies manufacturing. It is a footwear or orthotic sole and an insert with an outer bladder curved concavely relative to an intended wearer's foot location in the device. The outer bladder forms a component of the sole. An inner bladder contains a gas and is substantially surrounded by the outer bladder. The outer bladder and inner bladder are separated by an internal sipe including a media. The sipe is formed by an inner surface of the outer bladder and an outer surface of the inner bladder. The surfaces forming the sipe can move relative to each other in a sliding motion. Patent #: 8567095. Inventor: Ellis. Not Assigned. Monday, January 20th, is Martin Luther King, Jr. Day in the U.S.A.
Monday, January 20th, U.S. government offices, and much of private business other than retail, will close in observance of Martin Luther King, Jr. Day. Martin Luther King was born in 1929 in an America where, because of the color of their skin, nearly one in ten lived lives that were separate and unequal…taught in segregated schools…could find only poor jobs, toiling for low wages…refused entry into hotels and restaurants, made to use separate facilities. In a nation that proclaimed liberty and justice for all, too many black Americans were living with neither. If we consider the time from the arrival of the first slaves in the Virginia Colony in 1619 to the achievement of full civil rights for all African-Americans in every one of the 50 states in the 1960s, it was a very long struggle to achieve full civil equality. The modern African-American Civil Rights Movement that Dr. King was so important a leader in, on the other hand, was, for a major societal and legal change, relatively swift. It is generally considered to occupy the period from 1955 (Rosa Parks and the Montgomery Bus Boycott) to 1968 (King assassination and the Poor People's March). To those in the struggle it was long. But looking back, from 1955 to 1983, not quite 30 years, is, roughly, a generation. In one generation we advanced from a nation that tolerated legal discrimination against part of our citizenry based on the color of their skin, to a nation in which such as thing is not only forbidden, but absolutely unthinkable. 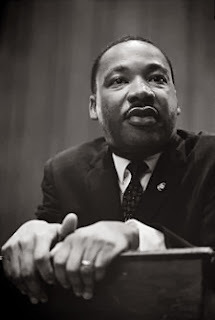 It was Dr. King, more than any other single leader in the civil rights movement, who, with his insistence on non-violence, and his prophet-like call to the conscience of White American, who brought about such a marvelous and much needed change. That is why he is up there with Columbus and Washington as one of just three men who so influenced our nation that we honor them with a federal holiday. But most important, there was not just a change of law; there was a change of heart. The conscience of America had been touched . Across the land, people had begun to treat each other not as blacks and whites, but as fellow Americans. Traces of bigotry still mar America. So, each year on Martin Luther King Day, let us not only recall Dr. King, but rededicate ourselves to the Commandments he believed in and sought to live every day: Thou shall love thy God with all thy heart, and thou shall love thy neighbor as thyself. And I just have to believe that all of us —- if all of us, young and old, Republicans and Democrats, do all we can to live up to those Commandments, then we will see the day when Dr. King's dream comes true. Do You Manufacture in the USA?